Here's a picture of the Crazy Crushed Can Accessory and lining, just before the sewing began. As you see there are corners pointing to the inside, and there are corners pointing in an outward direction. My last post was about serging the inward pointing corners. As promised, this is the one about outside corners. Honestly, I had never come across this method of sewing around outside corners before. In retrospect it's very obvious. It seems similar to production methods of sewing garments that I've read about. The Complete Serger Handbook by Chris James actually provides three different methods of stitching outside corners on a serger. This is the one that worked best for me with the Crazy Crushed Can Accessory. Step 1. Stitch the first side of the corner and just keep on going. That's right. Don't stop. Don't stop. Continue serging right off the edge of the fabric. Step 2. When the thread tail is about 4 inches long, turn the fabric so that the second side of the corner is in position to be serged. 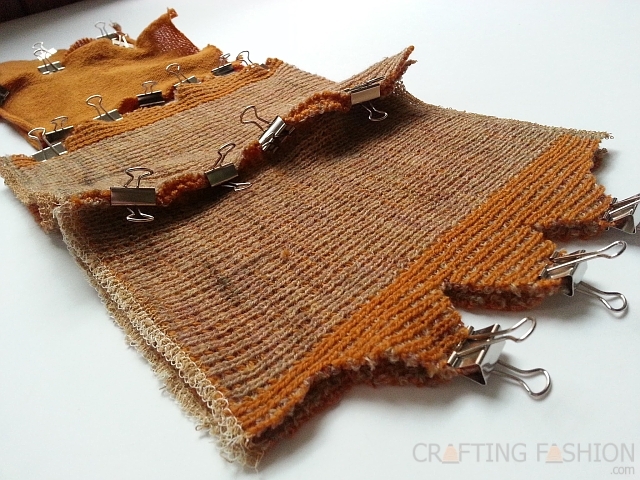 You can use the thread tail to help you guide the fabric into the correct position. You don't even have to lift the presser foot. Step 3. Stitch the second side of the corner. This is what is how it looks with both inside and outside corners stitched. The author gives the instruction to cut the thread tail with the serger knife as you begin stitching the second side, but I'm still not comfortable doing that. Important: If your project requires corners to be tight and sharp, I do not recommend using a serger. A sewing machine is much more suited to the task of sewing seams in tight corners. A serger can be used to finish the edges either before or after the seams are sewn with sewing machine, depending on the project. I did it this way to learn new skills and because sharp corners are not required in this project. 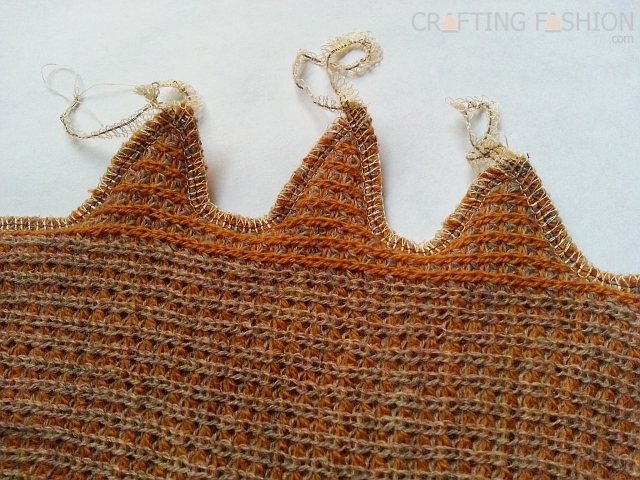 Another method that might be appropriate for the Crazy Crushed Can project is the one described in Revised Knit, Cut and Sew: Bk. 1 by Pam Turbett. She gives instructions to serge just one stitch beyond the edge of the fabric. Her next instructions involve moving the presser foot and needles and adjusting the thread. It's a bit more complicated than the Handbook method, but I think it may be useful. I'll just have to practice.